Mike and Margie met and began dating after they graduated from high school (they both graduated from Elgin High School). This all began for them in 2000. Margie is the daughter of George and Anita Werderich. She is a graduate of Southern Illinois University and is currently employed by Ball Horticulture in West Chicago. She's on a developing committee for Ball, designing "Green Living" and creating the "Green direction" for Ball Horticulture. It is the job of her dreams. Mike is the son of Jim and Julie Kelly and John VanWambeke of Elgin. He is currently the office manager of Illinois Aviation Academy and also holds a night position at UPS. Mike has a very promising future with IAA. 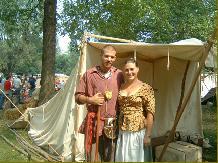 They ,both, enjoy the outdoors- camping, backpacking, rock climbing, biking, voyageur reenacting and gardening. They love traveling and visiting new places. Together, they have two kitty children, Bella and Aunt Zelpha. Mike's hobbies are fishing, go-cart racing, water gardening and skiing. Margie has her business, Natural Beauty By Margie and spend much of her time creating and keeping up with the demands of her little business. MargiesNaturalBeauty.com, if you're interested. Besides that she loves organic gardening, is active in our local civic groups and helps her mom totally (thanks, Margie).